Have you ever notices how many gadgets out there try to do something really cool, but end up falling flat? Too many times have there been gadgets or devices that try to enhance on something that could be something neat. Most of the time, it’s a gadget that tries to fuse itself together with another device. Not a bad call, if it works. We’ve seen our fair shair of “ring clocks” and “swiss army knife clock radios” to know that not everything needs to be put together. Very seldom will you actually come across an item that proves to be worth your time and hard earned cash. Should you actually find that needle in a haystack, then it might not be a bad idea to pick it up and try it out. Some of the devices that we use every day could stand to be put together. Remember the PDA? We started to get on the right track with that. With as many business men out there who are constantly dealing with presentations and projector problems, you’d think someone might want to make one as an attachment to your phone or something… Well, wish granted! The Ayane pico projector smartphone offers you the needs of a smartphone coupled with the convenience of a pico projecter. Now if you aren’t sure what a pico projector is, it’s basically a handheld projector that can offer pretty decent picture quality actually. 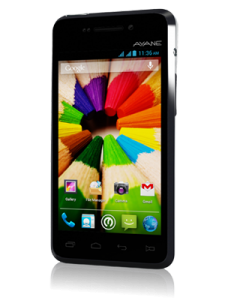 Now the Ayane smartphone isn’t anything fantastic in terms of specs, by any means. We’re talking a 1.2GHz duel-core processor operating on an MTK 6589 chip set for one. Already not a lot of power. It only offers 1 GB of RAM, 4 GB of internal storage space (which is actually expandable through microSD cards) and a 2000 mAh battery. 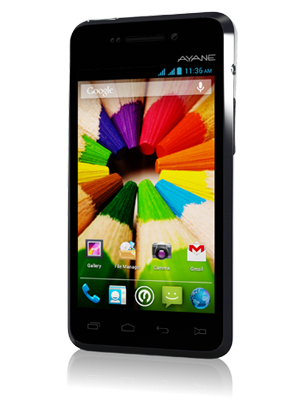 The phone runs on the Android 4.2 Jelly Bean OS and also comes with Wi-Fi capabilites. It’s more or less as basic as it gets, but it will do what you need it to do. You’ll also be met with a 5 MP camera on the rear of the phone and a 0.3 MP camera on the front of the phone. Even with the less-than-amazing inner workings of the phone, the top of the device is where all the fuss is about. The top of the phone holds the pico projector that offers images in 480p with a 1000:1 contrast ratio. The phone actually packs a decent punch in terms of the picture that it can throw. A 42 inch image from your phone isn’t bad no matter how you look at it. Even if the specs of the phone itself don’t come anywhere near what we are used to seeing from other companies, like Apple, the built-in pico projector is what might sell a few people. There are a few accessories that can come with the device as well, such as a tripod, but should you decide to pick up this little diddy, be ready to pay a good $500. Needless to say you’ll have to weigh out some pros and cons. There is nothing wrong with having a work phone, and a personal phone, especially if you know you are only going to be using your work phone for certain things like presentations. If a phone like this isn’t really your style, or if you’d rather not deal with losing out on the power of the phone’s components, there is nothing wrong with renting a pico projector for business meetings instead. Sometimes it’s just easier to kill two birds with one stone.